On April 8th we began receiving some of the last 800 guns of this issue of 2,500 35th Anniversary Christmas Dream guns being produced. Guns numbered from 0001 to 1700 are sold out. These final 800 guns are numbered 1701 - 2500. If you have reserved a number, you will be notified when we have it ready to ship. We should have all of the remaining guns available to ship by April 17th. It's been thirty-five years since Daisy modified the world-famous Daisy Red Ryder BB gun , adding a compass and sundial to the stock, to create the "Christmas Dream" edition in 1983. The Daisy museum has commissioned Daisy to produce a total of 2,500 numbered 35th anniversary guns with those features. The first production run (0001 to 1000) and second production run (1001 to 1700) are completed and have sold out. The last group of guns numbered 1701 o 2500, is in production now April 8 - 17.. Once those last 800 guns are built, the issue is closed. The American wood stock is engraved on the right side with the Red Ryder signature logo. 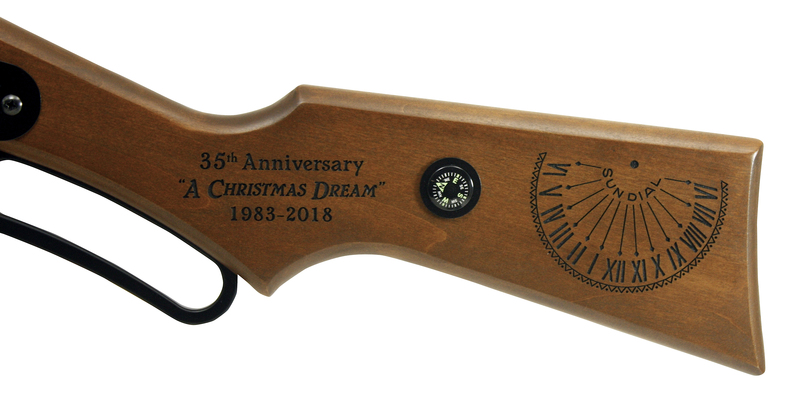 The left side of the stock is laser engraved "35th Anniversary A Christmas Dream, 1983 - 2018" with an engraved sundial, and has a compass with bezel inset. The left side of the wood forearm is engraved "A Christmas Dream #### of 2500." Each gun is numbered 0001 of 2500 to 2500 of 2500. Our Friends of the Museum have been given the opportunity to purchase their Friends numbered gun. (Guns 0001 and 0002 are, as with any limited issue gun, part of the Museum's collection.) All numbers not spoken for are available on a first come first served basis. The gun features a die cast metal cocking lever and a natural copper plated forearm band. It comes in a plain kraft package with label and a authenticity card. Priced at just $69.99 they make a nice addition to your collection, an heirloom for family members - and the perfect Christmas gift.